Mrs Carrie Harrison, wife of Sonny Harrison, died at Good Shepherd hospital Tuesday around 4 pm. Funeral was held from St Peters A. M. E. Z. church Friday at 2pm. Rev. E. T. Melver, officiating. She leaves to mourn their lost her husband, 10 sons and 3 daughters and a host of relatives and friends. Mrs. Carrie Whitney died after a short illness. She is survived by her husband, John Harrison, several children, two brothers, and other relatives and friends. What a great picture. He looks so satisfied and focused and she looks so happy to be with him. She left quite a family. I hope they were grown when she died. I love this picture too Kristin. 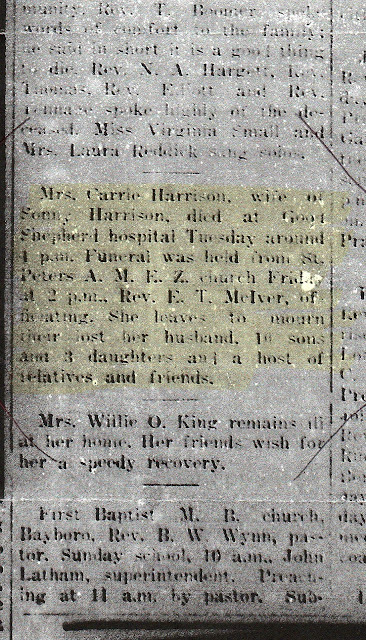 Unfortunately my great grandma Carrie died from complications that arose after a c-section delivery of her last child. The baby and 5 other children ranging in ages from 6 to 16 were still at home. 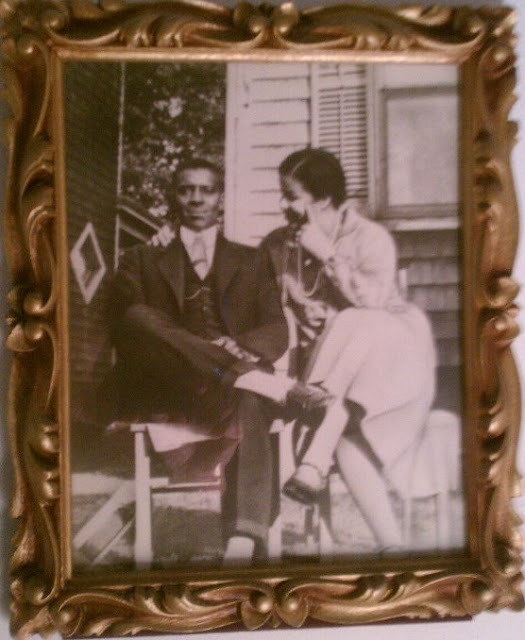 My great grandfather's sister helped to raise the baby. My heart breaks when I think about this. All those children without their mom. She was only 41, so that hits home because I just turned 40. So young. Oh, that's sad. I'm glad your great grandfather's sister was able to step in and help. I agree, this is a great photo. I came across it on the Geneabloggers pinterest page and had to read more. I'm sad to read that she had a sad ending. It especially hits home since I've had two c-sections myself. I can relate to you and her on that one too. I've had two c-sections myself. A surgery that is so common place now, we take for granted that complications can occur. Thanks for stopping by! Thanks for sharing! I can so relate to this story. Loved the pictures. I hope the children faired well after their lost? Beautiful photo! I just love the way she has her finger to her face - makes her look sassy!